If you follow me on Twitter, you may have seen a few of my rather straightforward tweets in which I repeat some of the main criticisms of bike share offered by NIMBYs as they fight tooth and nail to move Citi Bike stations from their blocks. These tweets are typically followed by pictures that belie that very criticism, showing that the problem they’re predicting bike share will cause already exists and is caused by cars. Yet somehow the NIMBY logic doesn’t extend from removing bike share stations to also removing car parking. Here are some of the typical NIMBY complaints about bike share stations, accompanied by pictures. If you have a response or an addition, please leave it in the comments. I’ll even send an “I [BIKE] BKLYN” button to anyone who can come up with a fair criticism of bike share that doesn’t also apply to cars. 1. Bike share stations pollute the street environment with brightly colored corporate advertising. 2. Bike share stations do not belong in historic, landmark blocks, some dating back to the 19th Century. 3. Bike share stations block pedestrian access to the curb. 4. Bike share stations block pedestrian access to residential buildings. 5. Bike share stations block pedestrian right of way on the sidewalk. 6. Bike share stations make garbage collection difficult and cause trash to pile up between docks. 7. Bike share stations clutter sidewalks all in the name of promoting a private business. 8. 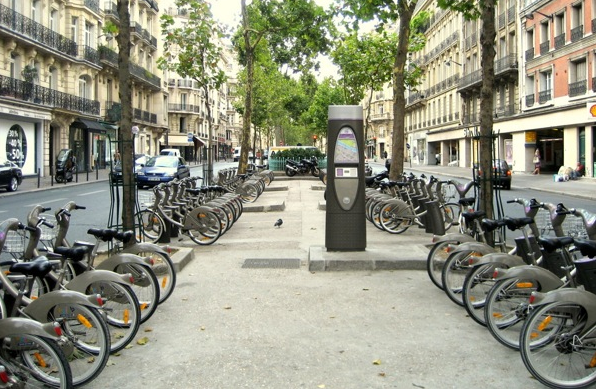 Bike share stations are much smaller in Europe with only 10 to 20 bikes each. 9. Bike share stations will bring noise to otherwise peaceful neighborhoods. Now, that is how a spokesperson responds! Ok, Ok, I got it: Bike share renders its users smug and self-satisfied. You might get a button. 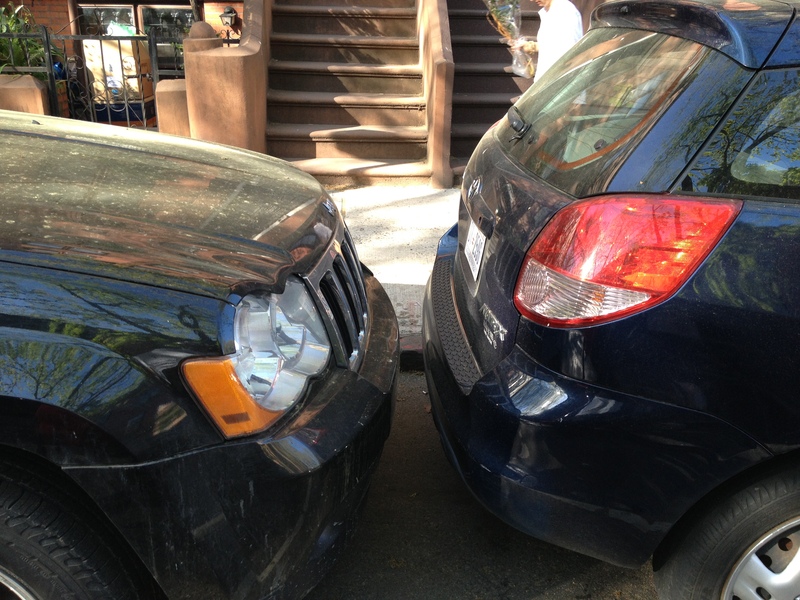 Car culture makes drivers blind, illogical and defensive. You’re right! When I drop my daughter off at day care, the first thing I do is shave my legs and wear spandex. I even take some performance-enhancing drugs just so I don’t get too tired from carrying her lunchbox. But that’s not a criticism of bike share, so no button for you. Cars don’t make NBBL or the Soho Alliance froth at the mouth. Ha! That is true. And certainly a (hopefully) short-term disappointment. But one clarification to the rules, I suppose. The criticism of bike share stations has to be one that argues for their removal or relocation that would not also apply to automobiles. Can it be done? Staten Island is a special case and should have a different bike share system, such as Sobi. With Sobi you do not have to lock your bike to a fixed dock. The self locking bikes can be locked to a street sign or any bike rack. Thousands of Staten Islanders could ride Sobi bikes to the ferry in the morning. The ferry would have to provide a few hundred racks. Then upon returning via ferry SI residents could take a Sobi home. It would be less expensive to set up and serve the special needs of Staten Island. If you live in SI and you want bike share, look into http://socialbicycles.com/ and make it happen! Thanks for the thought but I would rather see SI incorporated into one comprehensive citywide system. Thousands of SIers could also ride CitiBikes to the ferry in the morning, too. Don’t see why it’s a ‘special case’ with ‘special needs’…why should people have to hunt for a bike locked to some random place when you can have dedicated racks in denser neighborhoods where people always know where to find them? 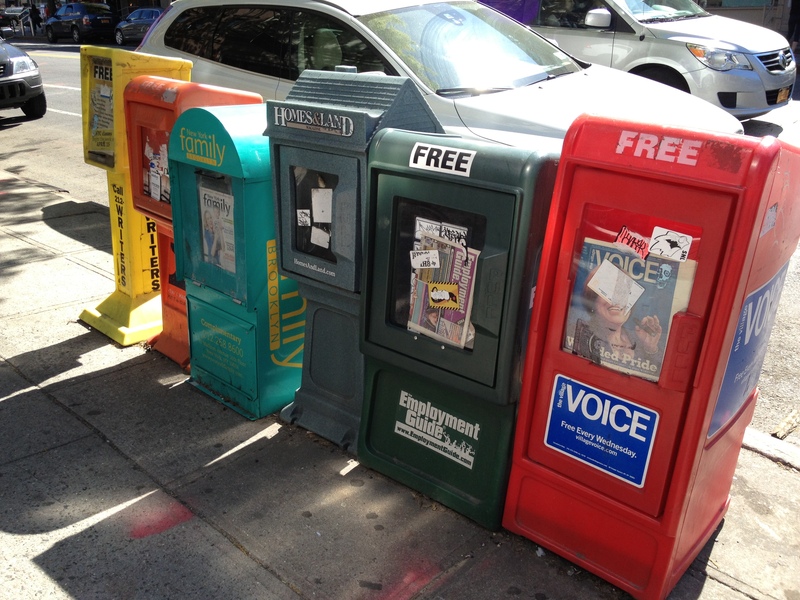 Why should SIers have to pay for 2 separate systems if they work in Manhattan? Bike Share causes a decline in gym membership fees, and an overall drop in therapy sessions. Oh, jesus, I think this is one of your best posts ever. That being said, I think for point #2 on landmark districts, you just need a photo of a new car parked on a Cobble Stone street in a landmark district. 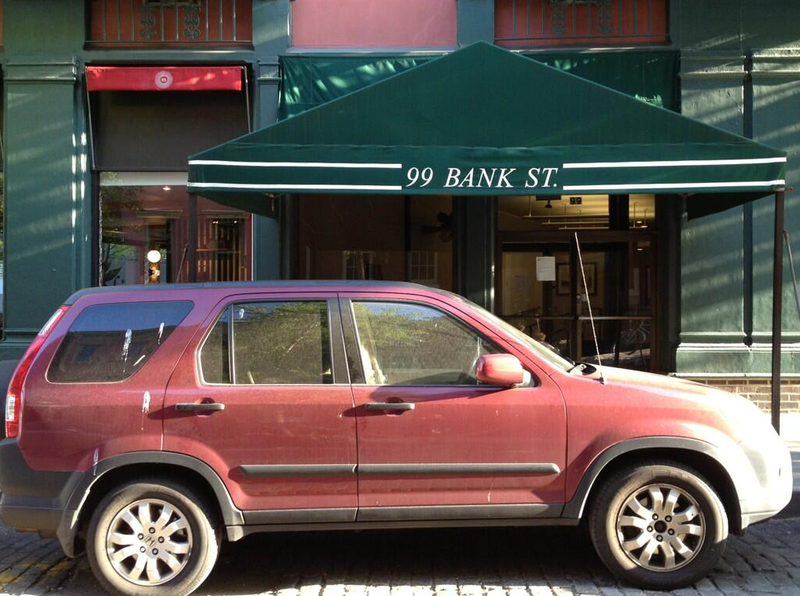 Though, I suppose, you’d pretty much just end up with a Bank Street photo essay if you did that. Thanks! I kinda did the Bank Street/landmark district thing in my last post. §6-41 Siting and Clearance Requirements. (a) Pedestrian passage. Sidewalk clearance must be maintained so as to ensure a free unobstructed pedestrian passage of eight feet or one-half the width of the sidewalk, whichever is greater. And the bike share kiosk has a map, which is information, and you need a credit card to make a purchase, which is technology….so where’s my button? 1. Are you sure that particular stations obstruct passage such that the “less than eight feet or one-half the width of the sidewalk” rule is in violation? Have you measured any spots? 2. Commercial vehicles such as taxis (which take credit cards) and rental cars frequently park on the sidewalk. 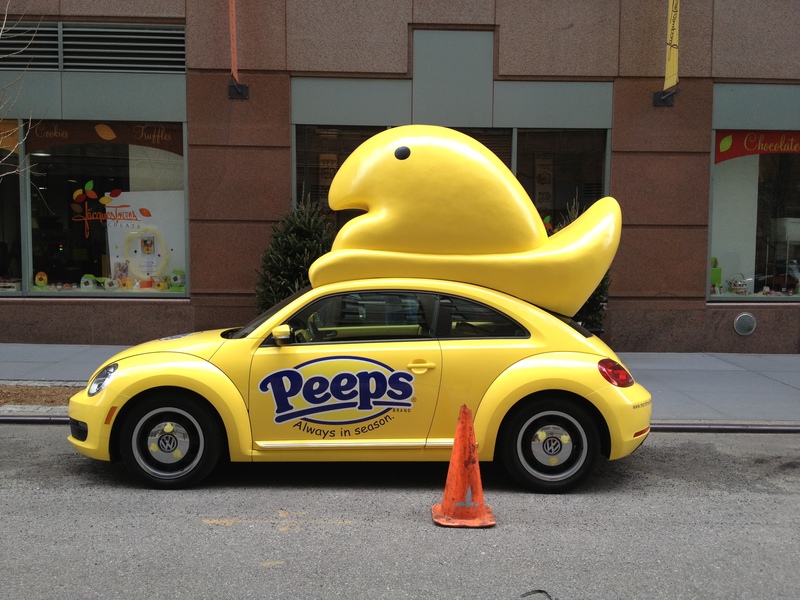 Part of the challenge was to come up with a criticism that doesn’t apply to cars. 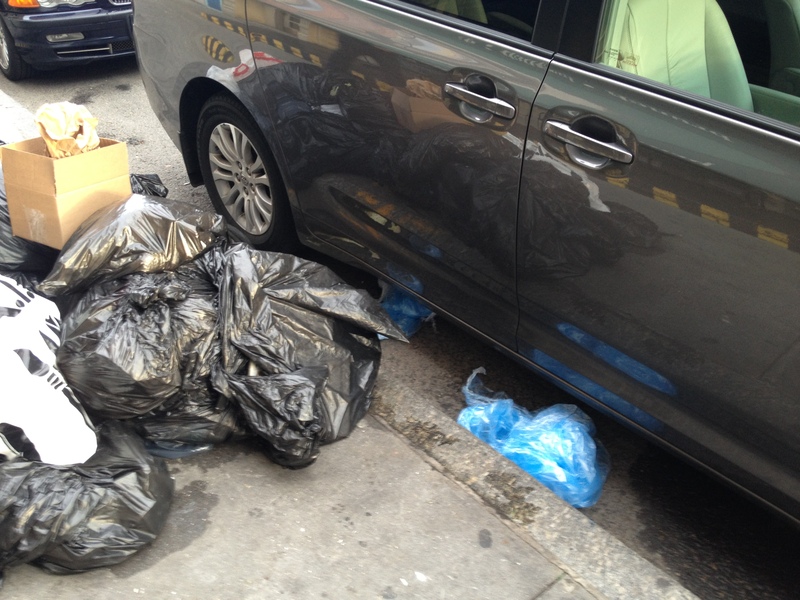 Yes, cars can be moved quickly if there’s enforcement, but my wife walks by this location almost every day. 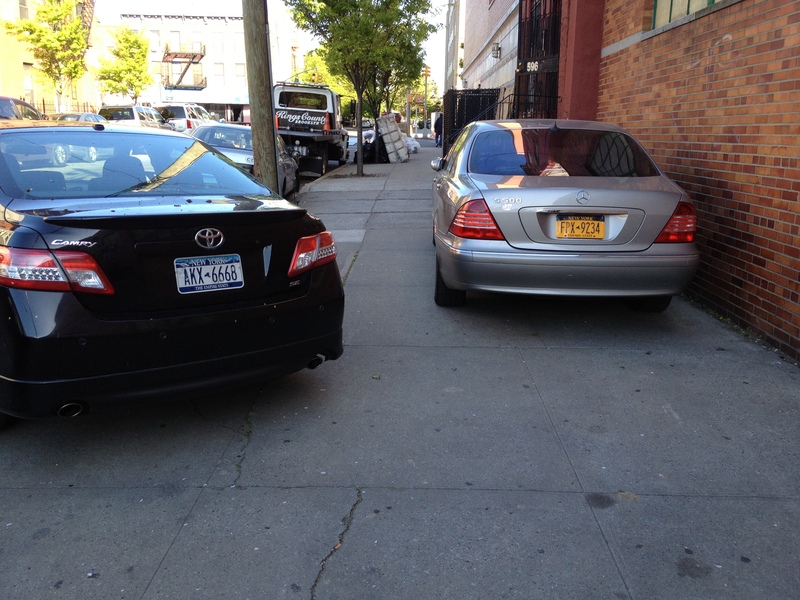 Cars are always obstructing her way and certainly take up more than half the width of the sidewalk. I’m willing to send a button though. Email me at brookylnspoke at gmail with your name and address. Ok, I think I can still redeem myself. (c) General Conditions. (1) Eight feet or one-half the sidewalk width, whichever is greater, shall be maintained by the permittee for unobstructed pedestrian passage. § 1202. Stopping, standing or parking prohibited in specified places. That applies statewide, and since all of NYC is a Tow-Away Zone, I’m sure some form of constant pressure on NYPD or other officials would force the business to comply or face fines since it’s some kind of rental car place and one can argue that it is threatening the quality of life of neighborhood residents…hmm. Here’s one! Bicyclists are annoying and self-righteous. And they’re always swerving in front of me because they can’t hear my electric car. On top of that, they’re all dopers! And they shave their legs because they get a thrill from it, not for any real reason of road burn or aerodynamics. While DC tends to have a lot more sidewalk space than NYC, there has been little or no criticism of the bike stations (and people are not shy about offering opinions here). We are the largest rollout in the United States for now and most people love it. The program and stations have expanded to nearby Alexandria and soon the Montgomery County urban suburbs. My girlfriend is concerned about a bike share station that is setup near an elementary school yard (not in front of the entrance). Her concern is that bicycles are alluring to children and that this particular location may cause unwanted interaction between children and strangers on bicycles. As a father of two, I’d hate to sound flippant when it comes to the safety of kids, but I’m not sure I understand the concern completely. What would a stranger on a bicycle do or say that any other random stranger couldn’t do? This hasn’t been an issue anywhere else bike share exists. Also, a person on a Citi Bike will be a registered member or at least have swiped a credit card meaning that his identity and whereabouts can be discovered if need be. Well, in trying to understand my girlfriend’s concern, I suppose that other random strangers don’t have the allure of a bicycle. However, I could also argue that once bike share looses it’s novelty, the allure will be gone, and it will just be another bike share station. Children certainly are fascinated with bikes, that for sure. But you’re right. The novelty will wear off quick! The problem is these are geared towards tourists..I have passed so many families on rental bikes trying to go up the 1st ave bike route, which can be dangerous if you’re not used to passing in traffic. I can’t tell you how many 12 year old tourists with their families on rental bikes that are trapped between 2 parked cars on 1st ave because there is a bus trying to make a left turn and they don’t know what to do. It is more dangerous for the rest of us biking around nervous, young bikers or people who don’t know where they want to go. It’s one more thing for us to worry about. NOT SMART!! Put them in the park. Don’t tell tourists all bike lanes are safe because I can tell you from experience they are NOT. These are not geared to tourists. They’re a transit system. The subway isn’t geared to tourists. The vast majority of Citi Bike users will be New Yorkers. My current daily bike route already overflows fast and aggressive cyclists. Mix in thousands of tourists and locals with minimal urban cycling experience, and I have grave concerns that it’s a recipe for disaster. A lack of helmets further adds to my concern. It seems inevitable that accidents and injuries will rise exponentially. I’m a huge advocate for urban cycling, but genuinely worry about the size of the overall project. Wish the city would have tested the project on a smaller scale before launching at such scale. The system has been tested extensively in more than 500 cities worldwide. Most users will be locals, a d people with minimal cycling experience will ride cautiously. Crash rates are lower for bike share users in other cities than they are for people with their own bikes. Also, with any bike sharing system, you have to go big or don’t bother. The entire concept of a bike sharing system is that there is a bike station near wherever you happen to be, and there is another drop-off station near wherever you happen to want to go. There must be a lot of them, or it just doesn’t work. If it helps, I live in Madison (Madison Bcycle tweeted this article, which is how I found it). We’ve had a bike sharing system for a couple years now, and we have never had the problems you describe. And while visitors do ride, they don’t ride nearly as much as locals do (I personally swear by it; I absolutely love the bike share, and my only complaint is that there aren’t more stations near where I live). (one caveat: children aren’t allowed on our bike share. You must be at least 18 to ride a Bcycle). Well you fit twenty bikes in the space of two cars. That’s too noisy. And too much clutter. One big SUV or limo looks better. Do I get a button? “Looks better” is subjective. And one car alarm or one engine revving is probably louder than bikes going in and out. But I’m happy to send a button for the effort! Email me your address. Picking an expensive system enabled a big corporation to do a great branding exercise. So that company is Citigroup – recently named by Rainforest Action Network as one of the worst banks in regards to investment in bad coal (including mountain top removal). “Floating” systems such as those based on the SOBI system can have concentrated parking facilities – software can enable variable-pricing so e.g. you pay a little more to not leave a bike at one of the dedicated parking places. So, SOBI did compete against Alta Bike Share and lost — I agree why at the time it would have seemed more of a risk than Alta (leave aside the unpredictable things that have happened with Alta afterwards such as the software rebuild, Sandy damage and departure of its CEO) but how much did NYCDOT really need to risk as the city was not paying (directly) for the system? I sort of get the feeling that criticism of CitiBike is simply not cool — even if it comes from urban mobility professionals who have worked in bike share, and generally support bike share implementation. It has become too much of a symbol — what NYC needs is good and appropriate solutions: Staten Island does have different conditions… but is Alta Bike Share’s software up to that challenge? I have been called a NIMBY, too… or have had comments “Unliked” that suggested that Jane Jacobs might not be so excited about the greenwashing exercise for Citigroup. I have also proposed some complementary solutions to NYCDOT – and I like most of what they do but very much related to that it is important to understand how risky it can be for a USA-based mobility consultant to publicly criticize Janette Sadik-Khan’s decisions. I think there are certain advantages to floating systems like SOBI. For example, the ability to lock up directly outside of one’s destination — say, to pop in for a bottle of water at a bodega — is pretty good. But it seems to me that floating systems are more vulnerable to theft than station-based systems like Alta’s. I’m not that well versed on SOBI’s user agreements, but what happens if you lock up to a sign post or something a thief could cut and the bike is stolen? At least with Alta or B-Cycle systems, once you lock up the bike at a station the bike is no longer your responsibility. SOBI sounds very cool to me, but it also sounds like something that’s good for a smaller, contained area, such as a corporate or college campus. I could be wrong. Again, I’m not that familiar with their technology beyond the basics. I don’t think one is a NIMBY just because you don’t like the Citigroup branding of the system. I’m not 100% comfortable with the sponsorship of what is actually a public transit project, and I get that big banks are not the most popular institutions for a variety of very compelling reasons these days. I also get the Jane Jacobs side of it and do, in fact, chafe at anyone who seems to think she’d be okay with the branding aspect of it. But I recognize that in the absence of taxpayer dollars to fund bike share, this kind of sponsorship is a necessary evil. It was probably also necessary because of the very typical NIMBY reaction we would have heard had taxpayer dollars been used. Can you imagine that CB2 meeting two weeks ago had people felt that “their” money was being spent on a system they don’t like and won’t use? I think your criticisms fall within the realm of “nothing’s perfect.” Totally fine, in my book. Too much of this debate gets told in a he said/she said sort of way, with people portrayed as either 100% for or 100% against bikes. There are shades of gray all over. Bike sharing will become so popular that further gentrification will center around the kiosk locations forcing already high rents even higher. Every planner/artists/hippies/bicyclists dream will start to take shape when people realize how damaging cars are to their neighborhoods and blocks will be declared car free zones and drive gentrification and rents to unimaginable levels. This my friend is damage to the already struggling middle class that no car could do. Happy to send you a button for the thoughtful critique! Brilliant post, thank you thank you thank you. Bike share advocates are “militants” while automobile advocates are just normal people that want their 100% of the pie like everyone else. Awesome – Its funny how well the truth is comes through in these photos.